No matter where you go, it seems there’s a dandelion at your feet–or under your feet. 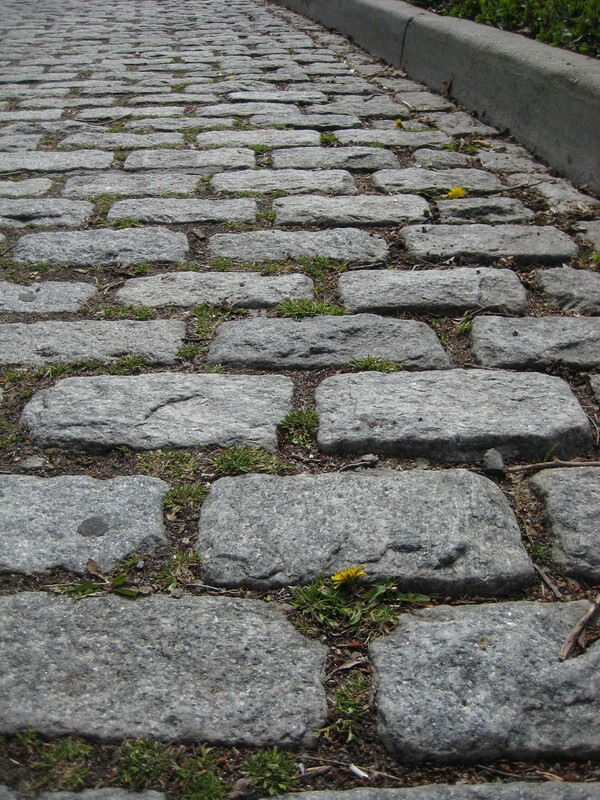 This is a cobbled pathway in Central Park, New York City. 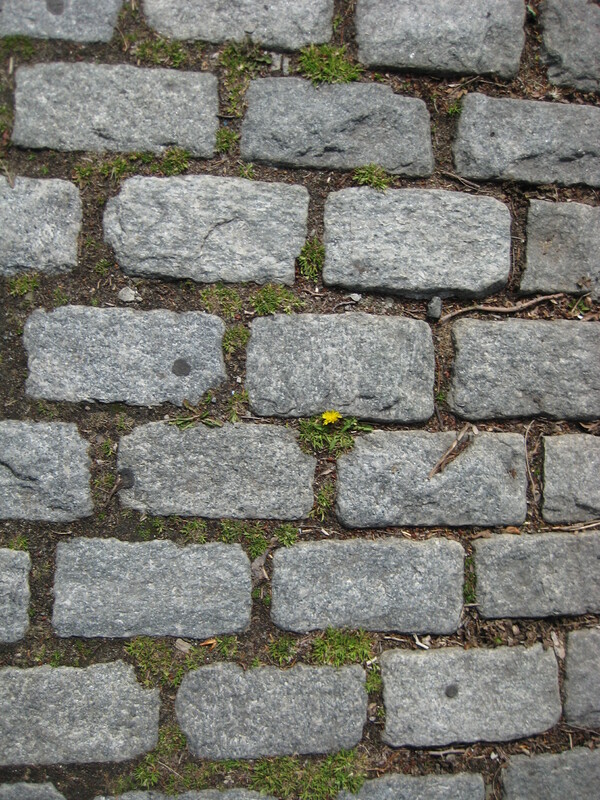 The dandelions don’t content themselves with growing on the lawn, they invade the sidewalk, too. 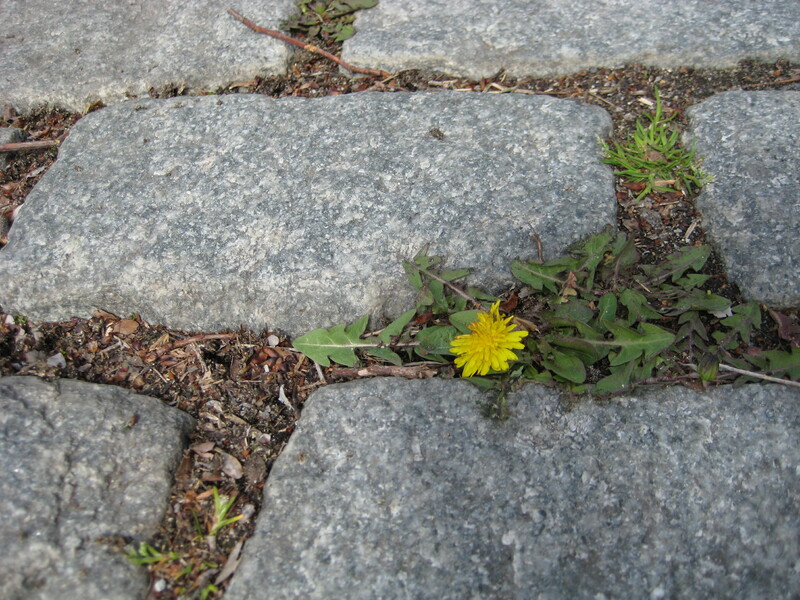 The flower and leaves manage to survive in the spaces between the stones. Just a few small crumpled leaves. Getting walked on all the time. How on earth can they do it? The secret of their success is in the root. Dandelions are perennials, coming up year after year, for five years or even more. So the root has time to get big. Even if the leaves can’t do a lot of photosynthesizing because they’re getting stomped on, the root can supply energy so the plant can flower and produce seed. Half of the biomass, or living material, of most terrestrial plants is found below the ground. Everywhere we walk–grass, sidewalk or paved roadway–beneath our feet there’s a network of living roots, like eels swimming beneath the quiet surface of a lake. The vast tangle of roots compete fiercely, vying with each other in a slow-motion battle for space, water, and food. In this struggle for survival, there are two basic root “game plans.” Some plants go long, sending the roots to grow deep, reaching for the sure thing: the constant water supply far below. Or there’s the opposite strategy, taken by other species: go shallow. The roots can spread out like the spokes of a wheel, growing quickly to form a spiderweb of rootlets all around the stem. This wide net can grab up the water from the merest drizzle as soon as it hits the ground, before it can evaporate. So, which strategy does the dandelion use? The slow, patient growth of the deep taproot towards the water table, or the quick, opportunistic use of every passing shower? Both. The dandelion quickly develops a wide network of shallow roots, followed by a deep taproot that is usually about a foot and a half long, but is capable of penetrating to a depth of ten feet (yes, feet) or more. So when you look at a little wizened dandelion poking through the gravel or the blacktop, remember. There’s a lot we’re not seeing. I met George Steele at a school in New York yesterday, and he recommended your blog to me. I’m glad he did. There is nothing like the surprise of a roadside dandelion sea this time of year; I know lawn-people don’t like them, but I do! So glad you stopped by! Yes, I’ve been having a love affair with dandelions for a long time. I’m trying to convince people not to use pesticides, but I figure it’s better to get them to appreciate dandelions instead of scolding.